Think of your favourite grand period-drama house. Now picture the servants having their supper downstairs around a giant, solid wood kitchen table. 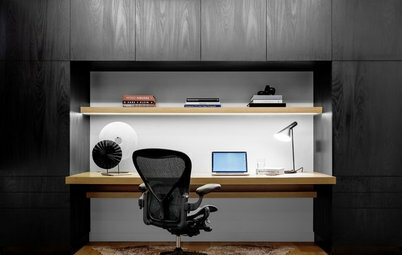 In the background, cupboards are beautifully made with dovetailed joints and solid wood. Brass cup handles and hinges glint in the gaslight. 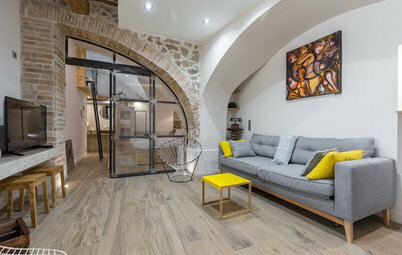 Doors have five panels, in the traditional style. 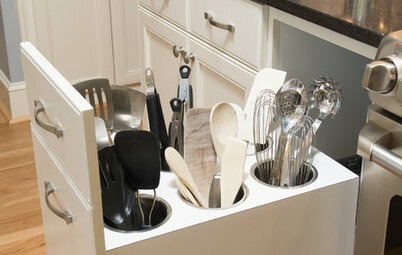 Sinks are ceramic and rectangular. Getting the picture? 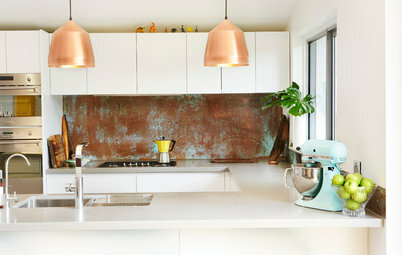 A quick scan through some of Houzz’s most popular kitchen photos will show you how loved this history-rich style has become again. 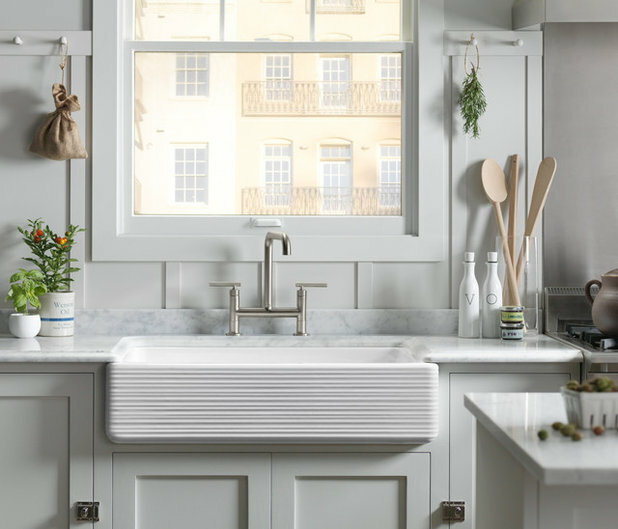 If you’re lucky enough to have a heritage-style kitchen in your home, let these examples inspire you with ideas on how to style around it. If you don’t (for such craftsmanship does not come cheap), pick up some of the fail-safe motifs you can borrow to help you hack your way to a heritage look. Dark or nearly neutral shades are de rigueur for this look, but for extra impact, take the idea and run with it. Here, the approach is inky blue all over. Saturate your space with your chosen paint colour and do doors, skirting boards, window frames – then choose matching accessories too. 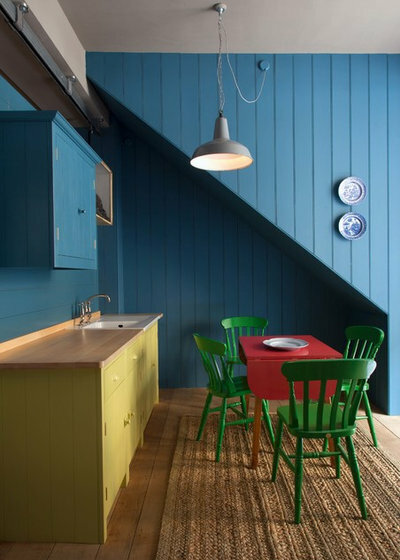 With no other tonal distractions, a delicate dash of another colour will now really make a design splash, whether it’s in the form of a painted chair or stool, as here, or simply a tea towel. This understated palette – pale blue and blue-grey – is wonderfully calming, but without the well-chosen accessories, it could also feel a little flat. 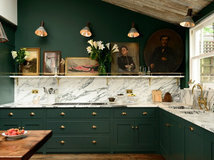 Rather than breaking up the tranquil ambience with colour in this kitchen, the owners have picked the items on display very carefully: glass and putty-coloured pottery, with just a couple of teeny spikes of understated brightness – pale green, turquoise, emerald – related to the overall colours. Wonderfully stylish. 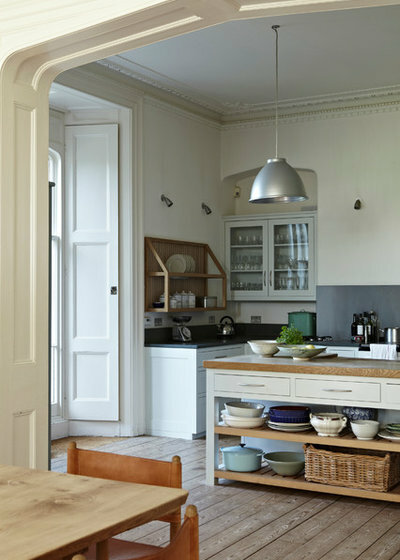 Grown-up display is a natural partner for this kitchen style, whether on a plate rack (see below) or in a glass-fronted cupboard or open dresser. These niche shelves are a nice contemporary take on the idea. Try the trick yourself by limiting your accessories to shades in the same tonal depth, or by keeping all your colours within the same range (either go monochrome or limit choices to the shades on a paint colour card). You can even do this with whites, off-whites and neutrals for a really subtle but textually interesting effect. 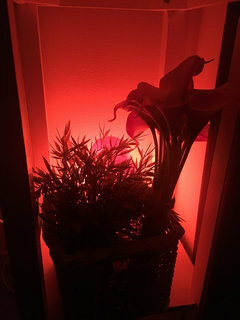 Experiment with ideas until you achieve the feel you want for your space. Can’t find the perfect downstairs-at-Downton-Abbey table to complement your heritage kitchen? DIY one. An antique table is ideal, but won’t be cheap (and your kitchen will probably have wiped out your budget already). Don’t be put off by versions of your dream table in less-than-lovely 1980s orange pine. This can be remedied, as seen here, by sanding, painting and finding the perfect wood treatment to turn your top from ugh to oh-my. There are plain oils, coloured oils to darken, beeswax for a lovely old-school smell, liming treatments to lighten, and more. Do some research and get excited about breathing stylish new life into an unexciting piece of furniture. 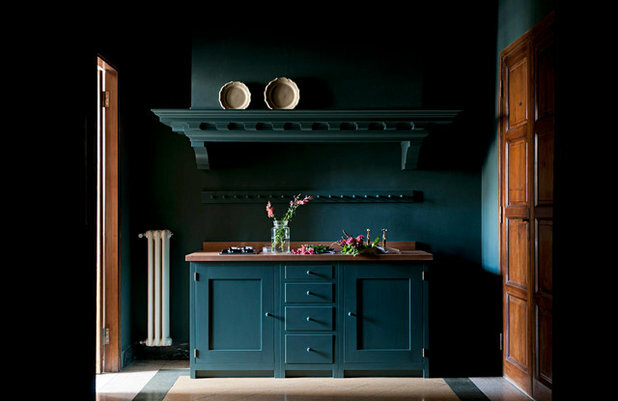 This is a slightly different take on heritage style, in that the cabinets are flat-fronted rather than panelled. 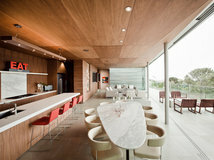 However, the room is most definitely dominated by one key material for this look: wood. 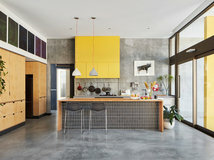 Another twist on the heritage style is the use of that strong, mainly primary colour palette, rather than the more usual super-dark or classily neutral tones used to conjure up kitchens from days gone by. However, the fact that the colours are dark rather than zingy, along with the addition of the tongue-and-groove panelling and factory-style pendant, keep this feeling decidedly classic. 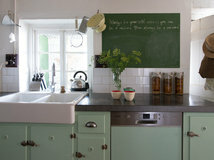 Here’s another kitchen that tips its hat to the heritage look, and yet makes up its own rules. The dark green paint and glass fronts set the historical tone, and natural or back-to-basics details – leather handles, lots of raw wood, simply packaged condiments and industrial-looking lights – enhance it. But the overarching minimalism and that flash of orange are something else. 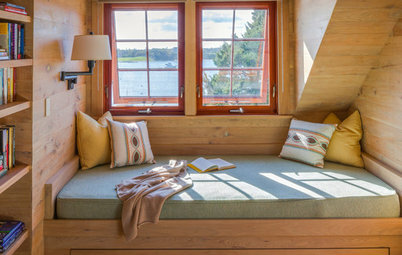 It just goes to show that focusing on one key detail – here, the island in the foreground – can provide enough heritage-y style to build the rest of the room around without having to update every unit. It also demonstrates that the right accessories can go a long way. A range cooker will show serious commitment to this look – especially financially. But isn’t it just the icing on the old-school cake? 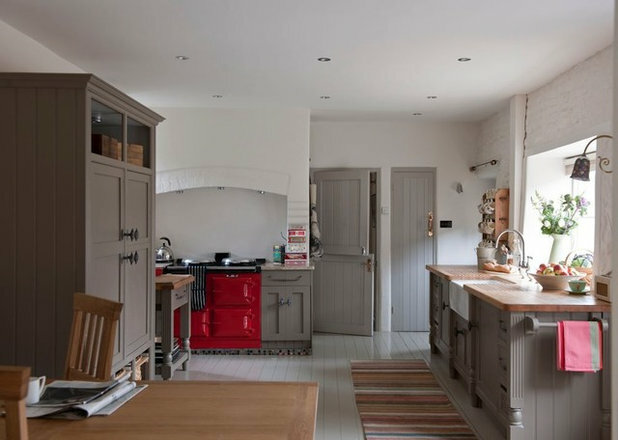 If you don’t happen to live with a sprawling country manor kitchen like this one, look out for compact city versions of these range cooker classics. You can even cheat and go for an electric version. 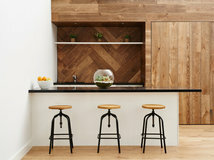 Any heritage-style kitchen worth its salt must include a good amount of natural wood, which suggests solid craftsmanship and signals a certain built-to-last background. 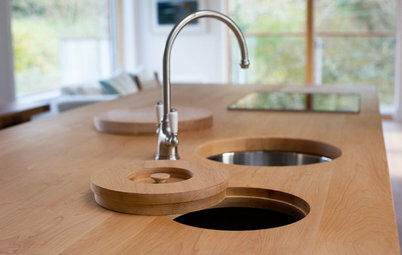 Wooden benchtops like these, however, don’t come cheap. So cheat! Consider wood-effect laminate, or pick something affordable that mimics marble, a suitably solid, natural alternative, or one that colour complements your units (see image two for some inspiration). 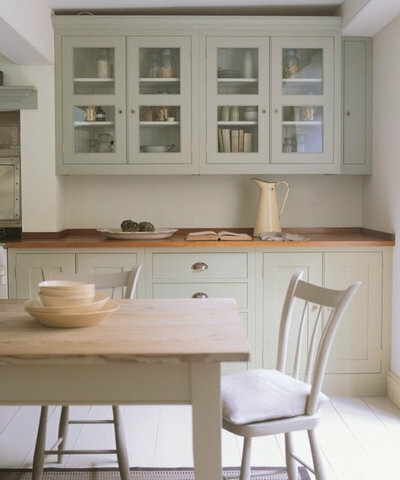 Then simply up the wood elsewhere – bare wood peg rails, chopping boards, chairs and tabletops will all tick that box. 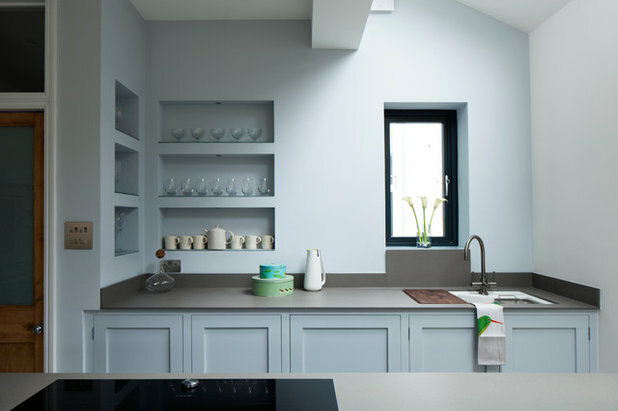 Now, with Shaker-style units installed and painted a suitably classic colour, you’ll be needing to decide what to put on show elsewhere to enhance the look. 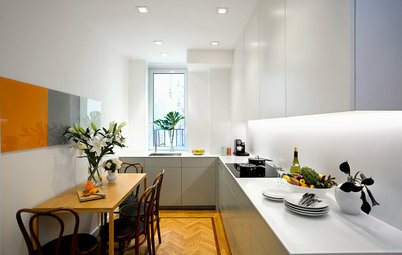 Light and airy looks lovely, but it feels rather modern. Conjure up candlelit sculleries by painting your space in a super-dark shade – even if it’s already a dark room. The effect is that it’ll feel cosy and authentic (though hopefully far cleaner and more user-friendly than the originals would have been). 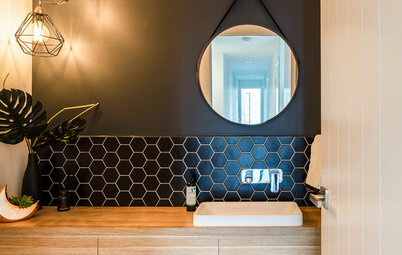 Dark wood accents are an unusual but effective addition over pale oak or pine. 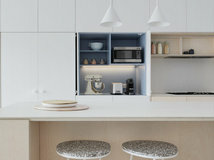 Although this is for sure a bold decorating move, the beauty of wooden cabinets and, of course, walls, is that they’re easy to repaint should you tire of the look. Peg rails – a classic heritage-look accessory – have already popped up; now here’s how yours could look. 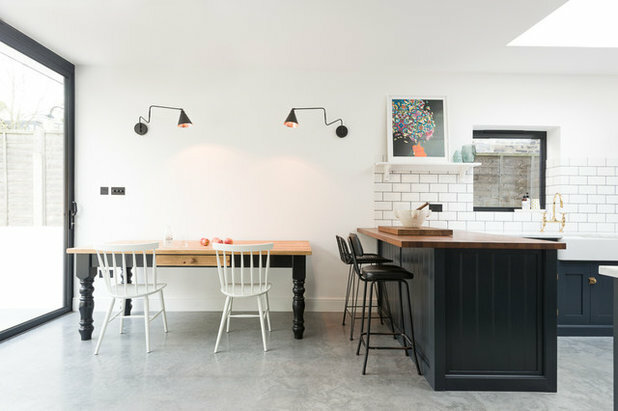 In this kitchen, bare wood has been limited to a smattering of kitchen utensils (still does the job though, doesn’t it?). Wood quota fulfilled, you’re free to paint old peggy to blend in with the wall and unit colour. Don’t be tempted to highlight it in a different shade; it might look cool, but it won’t be in keeping with the style you’re hoping to achieve. 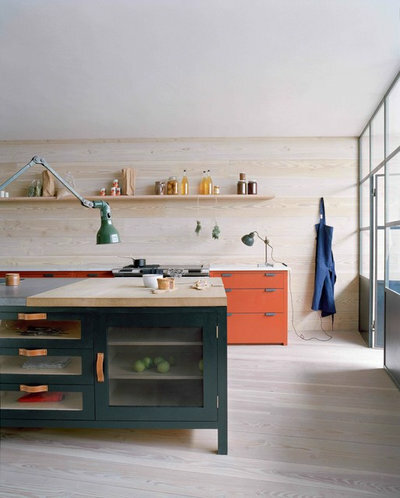 What’s your favourite style of kitchen? Let us know in the Comments below. Pressed tin panels, is that the 'original' pattern? 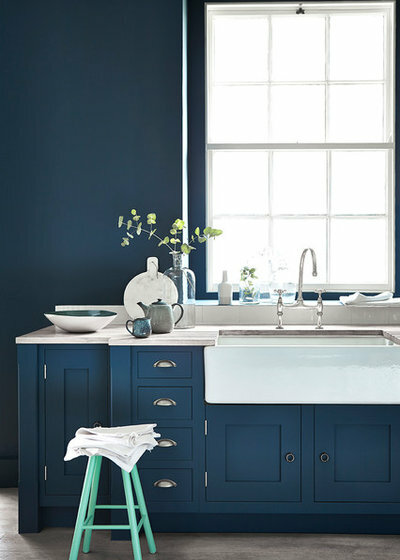 Blue toned kitchens are worn the summer they're very cooling and fresh ! Although in the winter can be a little cold and uninviting ! You can always incorporate a little orange tone in the winter I.e. Flowers, tea towels and oranges in a bowl ...they're always plentiful and cheap in the winter !